This book explores the growing intellectual interest in the politics of immunity. 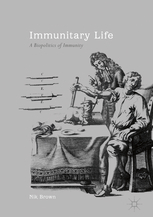 It argues that taking an ‘immunitary perspective’ is necessary if we are to better appreciate the body as a site of politics in the contemporary age. It explores the dynamic tensions between community and immunity, belonging and fragmentation, the social and the individual. It creates a dialogue between the social sciences, humanities and biopolitical philosophy around immunity.